Alyssa's Samson was born on 10-2-12. 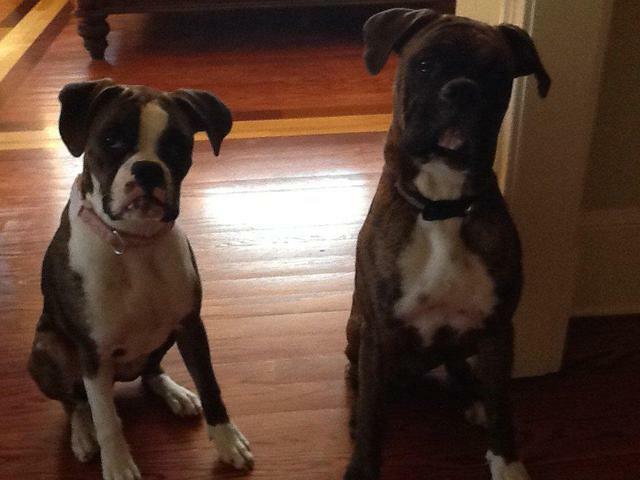 On the right he was 1 year old on 10-2-13. Hannah with her best bud "Sosuke". "Sosuke" is now 3 years old.They do everything together. Kevin with Zeena, just before going home to Charlotte. 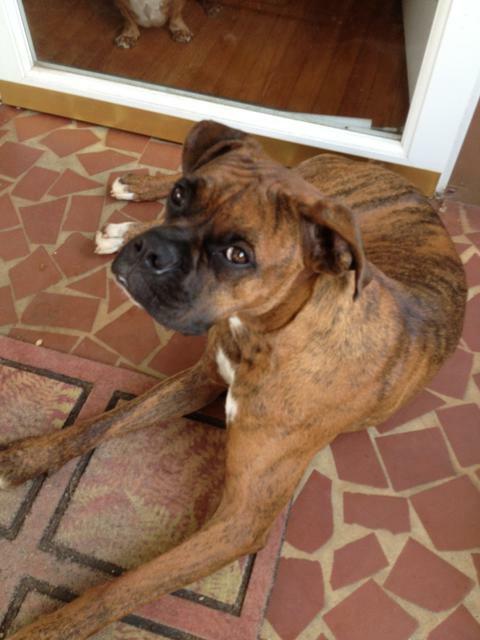 Zeena is a brindle boxer. 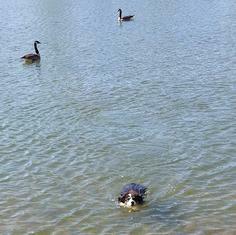 Maya Rose is growing up with Keith P.
Teresa's new puppy "Cabery" enjoys a swim in the pond with the ducks. Walt with his new BFF - Bryce. Bryce was born in January 2014. 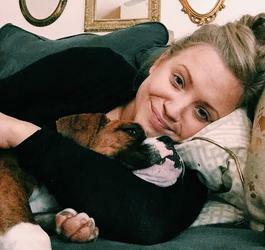 Hannah and Dallas are loving their new puppy, Apollo. 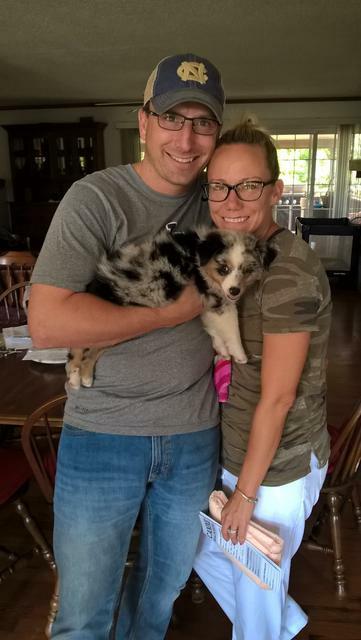 Dallas, Duane and Hannah are holding three generations of Australian Shepherds. 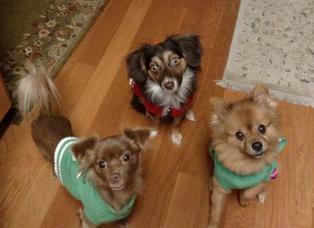 Ewock is the mother (in the middle) and their new puppy is Apollo. Their first puppy Sosuke is on the left being held by Dallas. 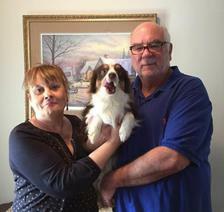 Chex went home on 8-7-14 and is already at home with his new family. 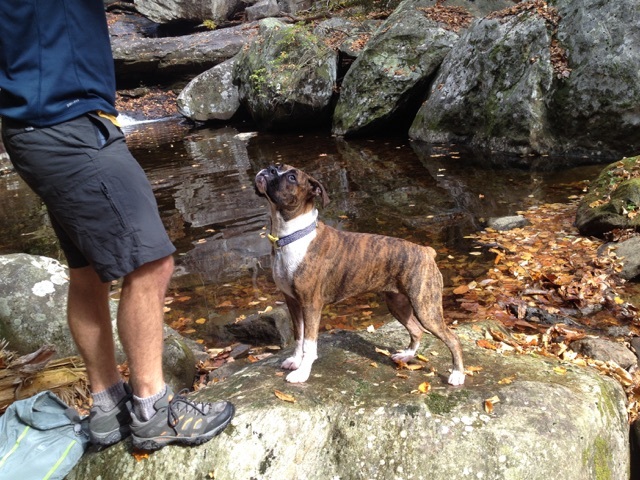 Randy F with his new best friend Riley play in the creeks at South Mountain Park. and the Hamer family loves them. Dax holding his new best friend, Phoenix. play in the park. David and Donna now have Miss Mandi, Zuri, Jayco, Scout and Toni Bird. What a family !!! Bailey is taking a nap with her toy at the home of the Wilkerson family. Her new Forever Home !!! 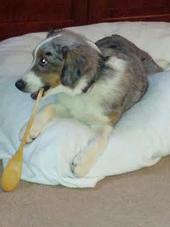 Maximus is in his new home with his new family, the Kisluks. 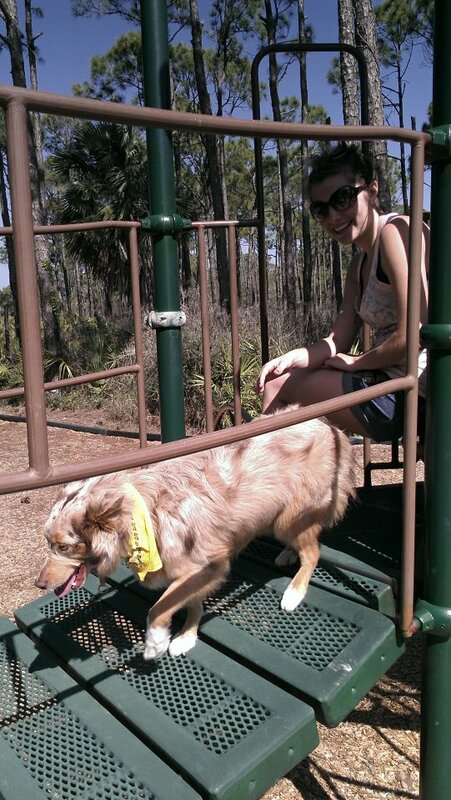 Riley enjoys a day at Broad River Greenway in Boiling Springs with Michele. Brez has just graduated from Obedience School and he has his Graduation Cap on to prove it to Kim and Linda. Shilo is now 9 months old. 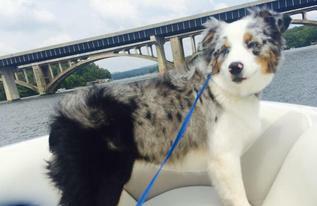 Loves the family and of course boating, digging and relaxing with Schroeder family. 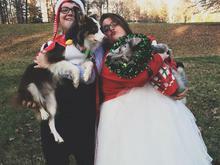 Gus and Balou (the Mini Aussies) pose with Caleb and Emily at their wedding and also with some Christmas attire for the entire new family. 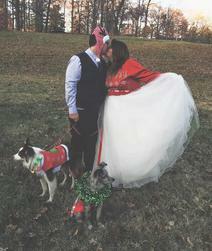 Caleb and Emily say their babies are smart, loyal and very loving. 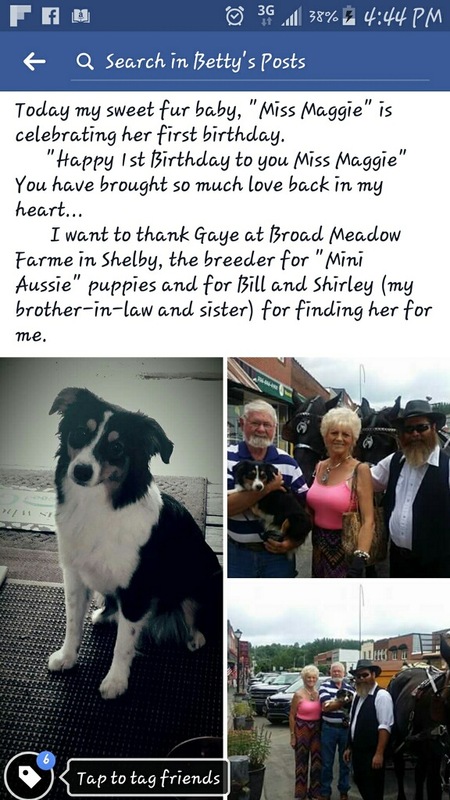 We wish Caleb, Emily, Gus and Balou many years of happiness. 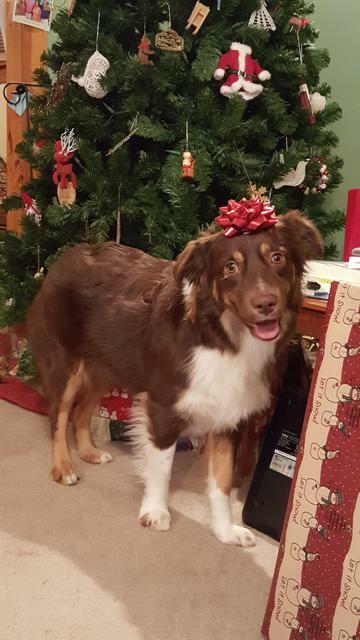 Jessica sent me Ember's 2015 Christmas photo. 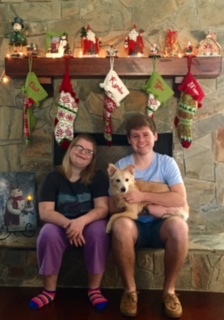 This is Ember's second Christmas with Jessica and Katie. 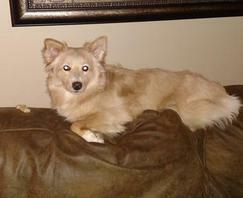 Ember says "Merry Christmas to all and to all a good woof, woof ..."
Penelope is taking a nap on the couch with Mommy. 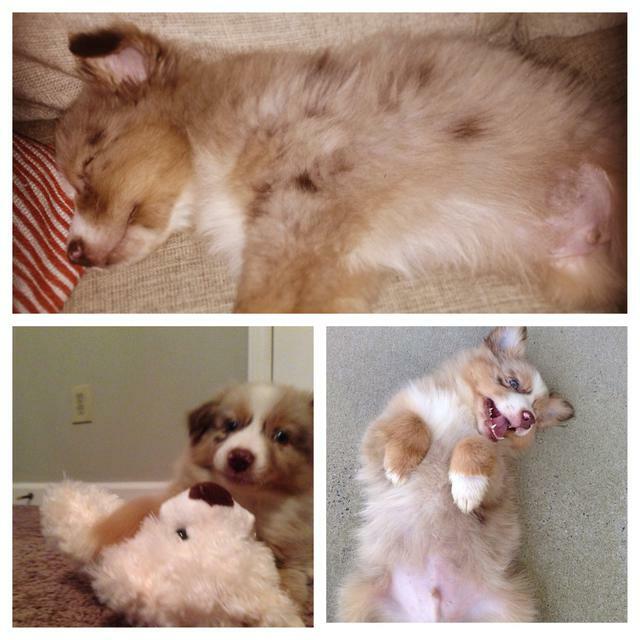 Penelope likes her naps. Paul is holding Koda. 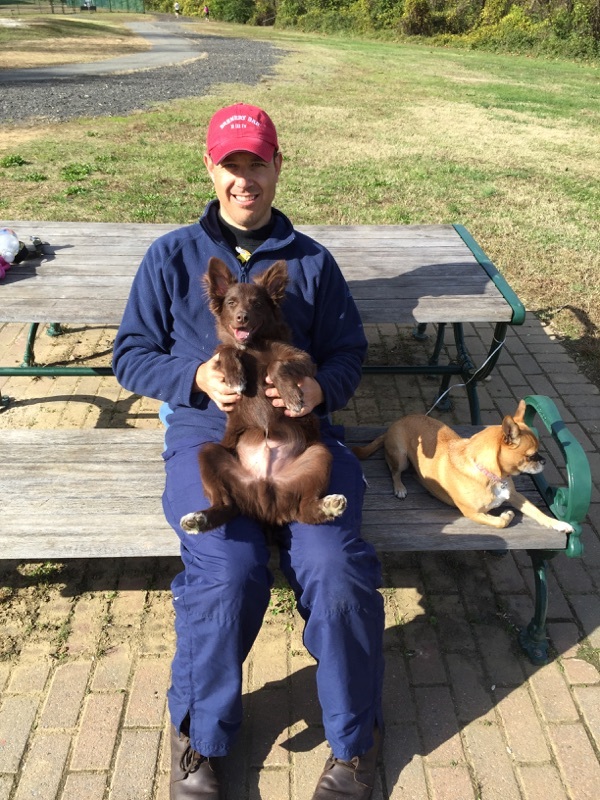 Paul reports that Koda is very playful and keeps him going steady. Koda's new friend is sitting beside Paul. 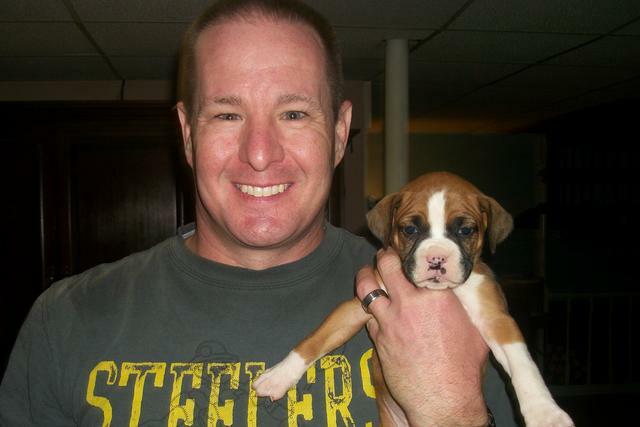 The Rapp Family enjoys their Christmas Season with a new member to the family. which was born in Jan of 2015. 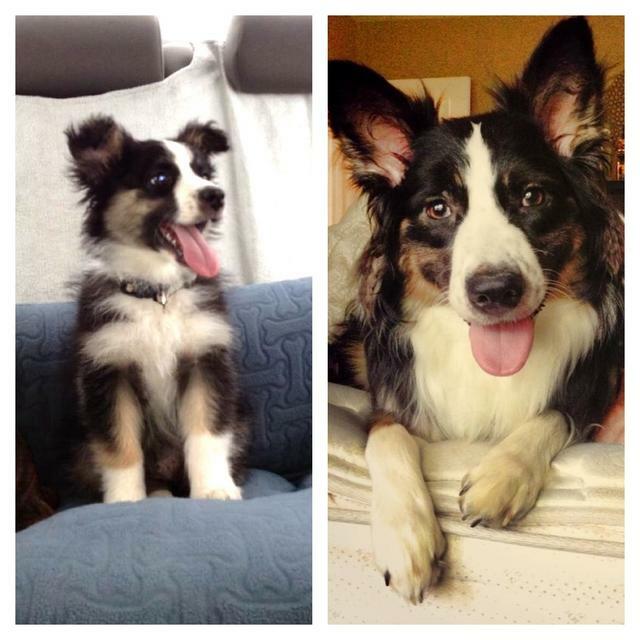 Julie sent us photo of Spudd, going home 1 year ago and today. 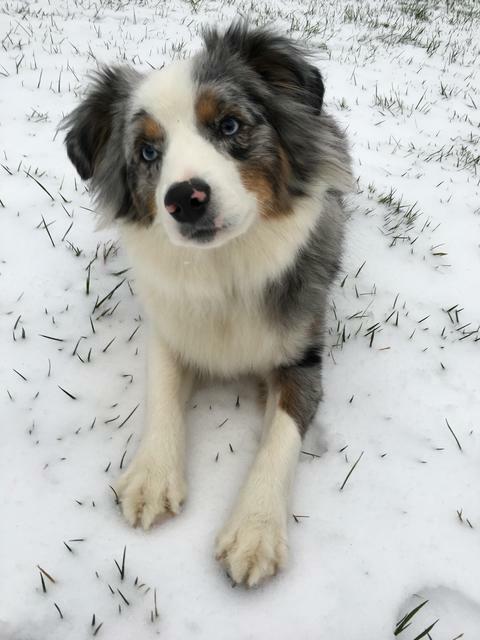 Shilo is 1 year old and enjoying the snow at the Schroeder home. living with Jo Carol and her family. 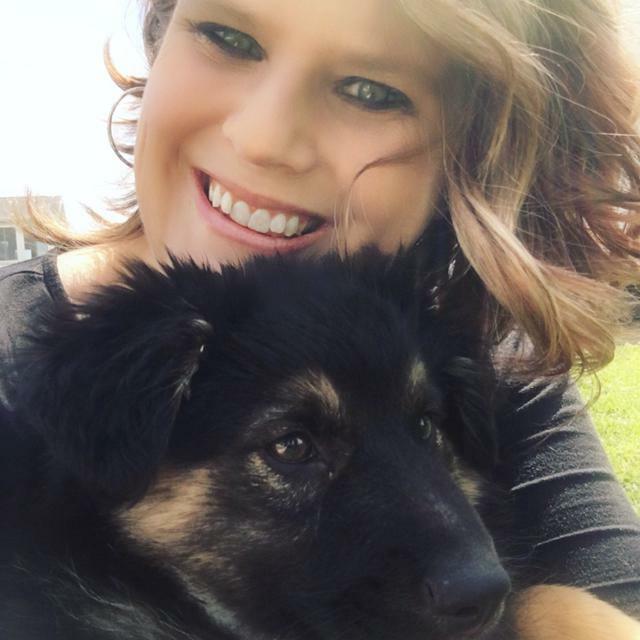 Natalie and her sweet girl "Remi". Remington is one year old. The Moore family with their mini aussie Ralphie, out for a ride in the family car. 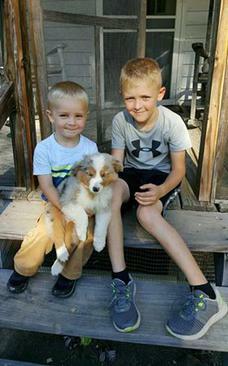 Walt's new puppy Beckam is being trained by his two year old Bryce. 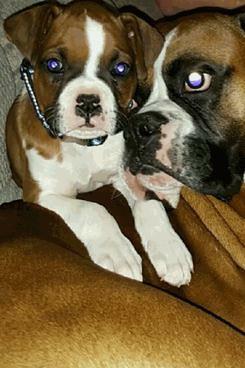 Both boxers came from Broad Meadow Farme. 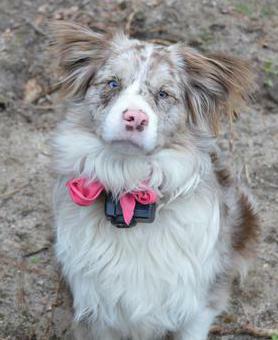 Clint is a one year old blue merle Mini Aussie. Named after "Clint Eastwood". 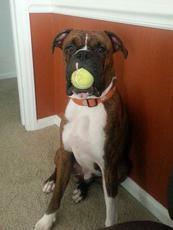 He swims, fetches and his family loves him. 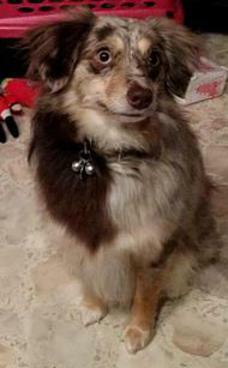 The Elder family loves their smart Mini Aussie.Small photo, Clint is now 2 years old and loves his home. 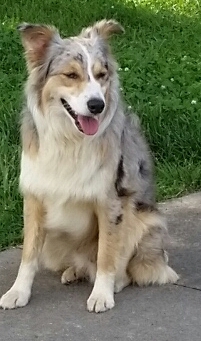 The Almassy family pick up their Blue Merle at the farme and prepare to head home. 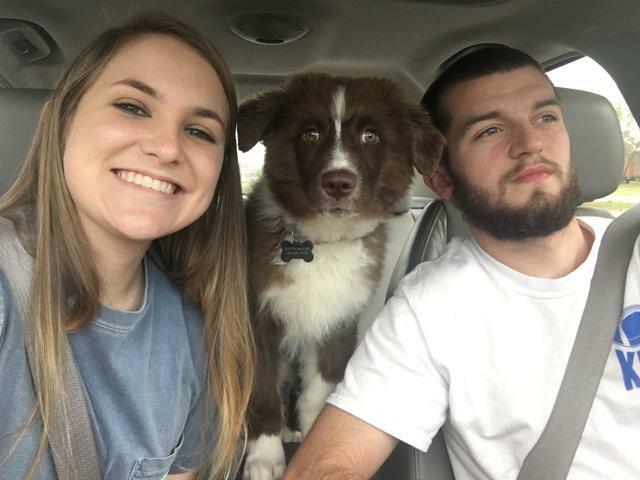 Their new baby is so excited to start her new life with mom and dad. Tonya's new family member, Lily is resting in her new home. 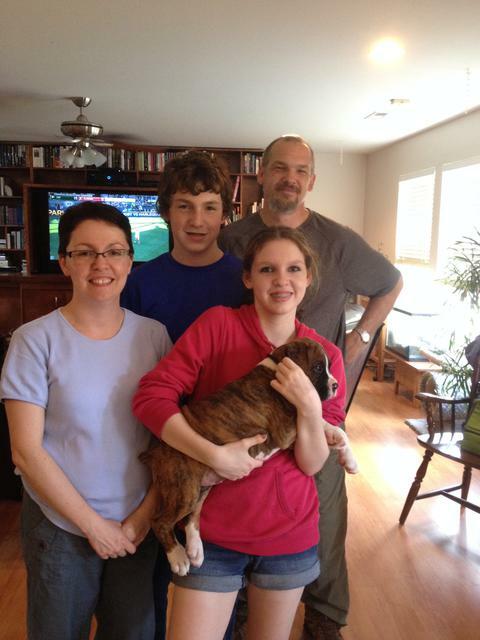 Lily fits right into her new family and new home. The White family greet their new puppy. 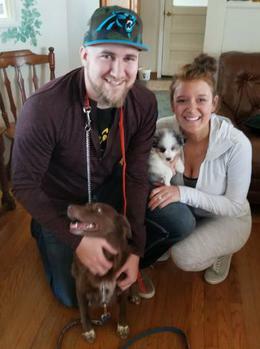 ​Stella is overwhelmed with the love and attention from her new family. 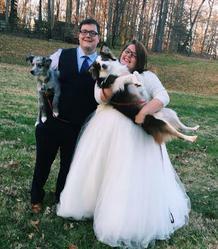 Nash (red tri aussie) and Lexy enjoy a moment before the ceremony. 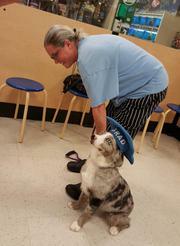 The Hancock family goes shopping with their new blue merle puppy (2nd from right). Ben is the photographer for his family. The Ford family enjoy time with their new aussie. Kayla and Keyseng pose for a new photo in their yard. 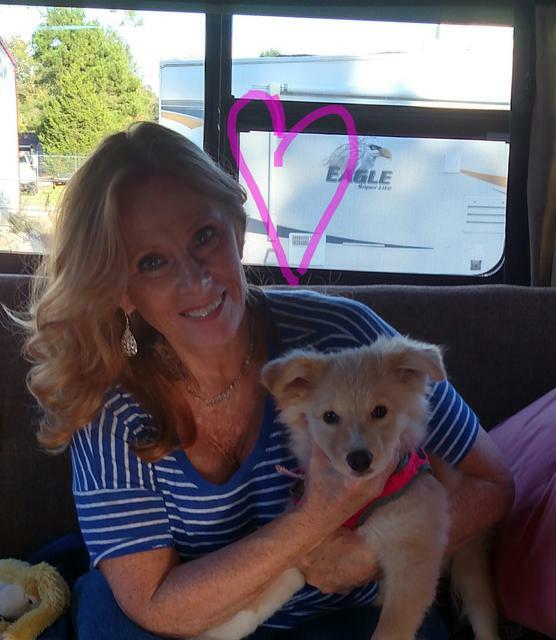 her new mom in Virginia. Nash (red tri aussie) and Cooper (black tri) sit together for a family photo. 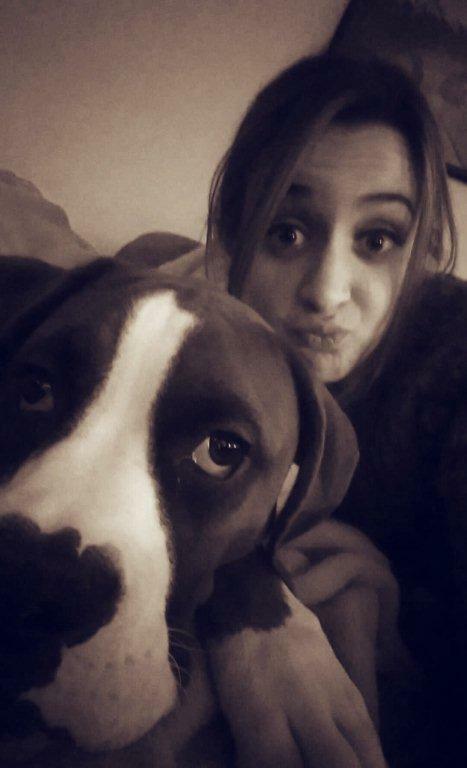 Nash is also pictured above with Lexi. Cooper has joined a great family and he is happy to be home. Nash (red tri aussie) and Cooper (black tri) sit together with mom and dad on their front porch. Happy Family!!! 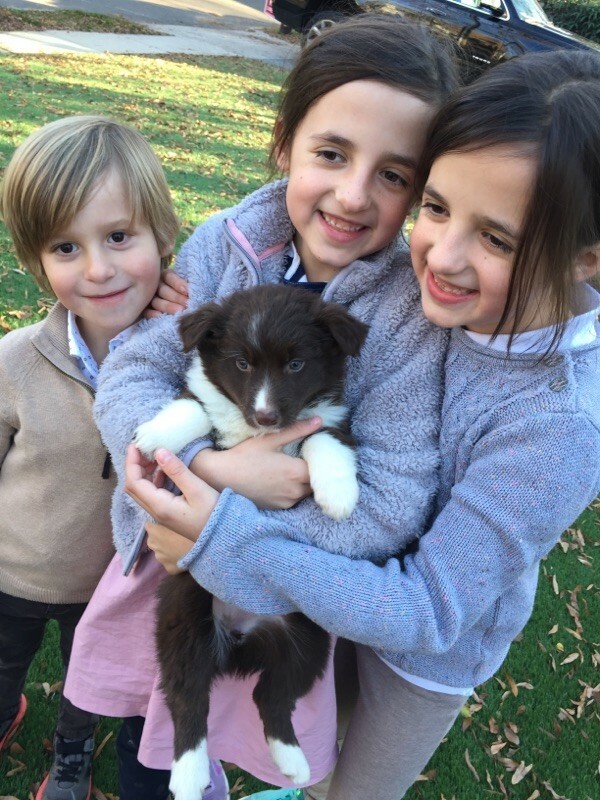 The Geiger family is loving their new mini aussie and have named him "Mooji". 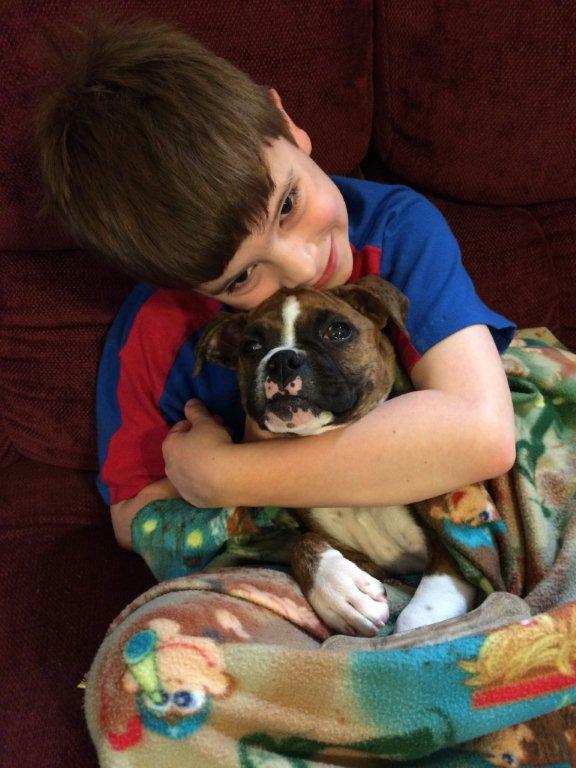 He is best friends with the youngest member of the family as you can see in this photo. Allena in Naples. 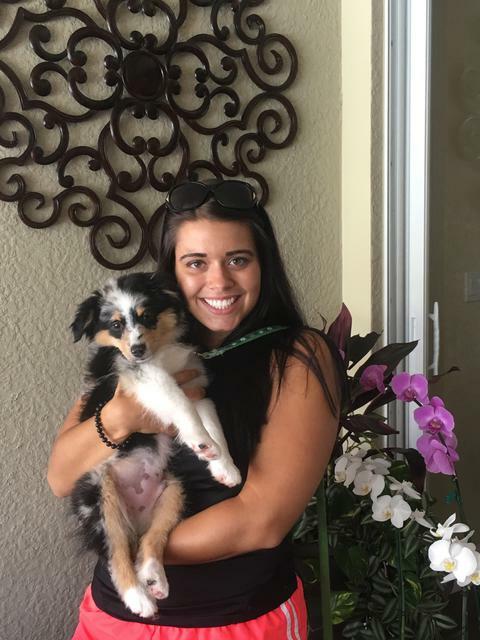 Florida is loving her new Blue Merle puppy. 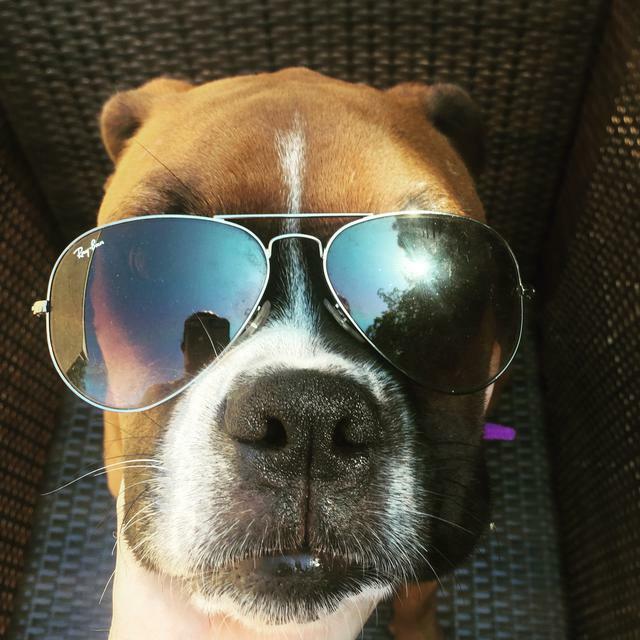 Stay cool in Florida. 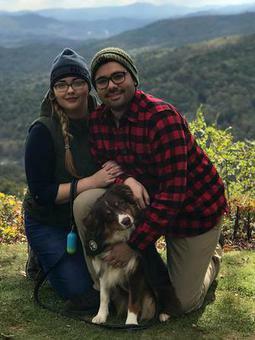 Logan is now 9 months old and loves camping and biking with his parents-The Alfaro's. Penny's Baby - all grown up now. 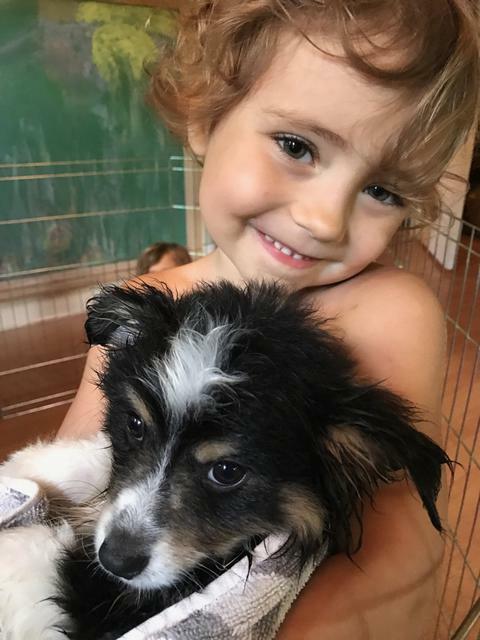 Nicole and Jeremy just got another puppy from us and his name is Scout. 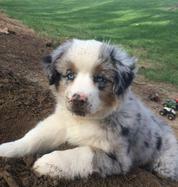 Rome (their 3 year old aussie) is enjoying his play time with Scout. Vernette and Larry hold their baby. This is Little Red's baby boy. 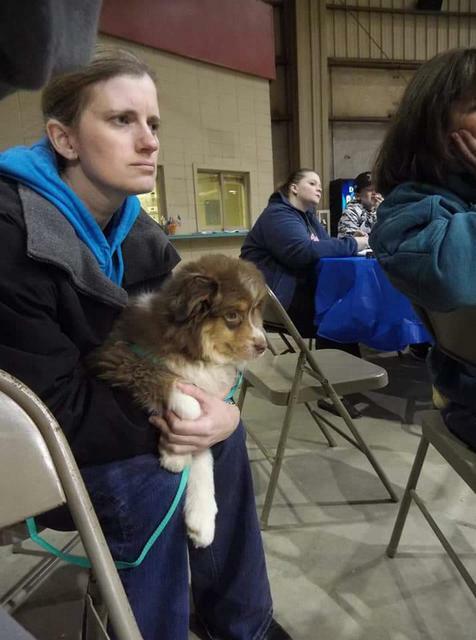 Hank went to his first horse show with his mommy. Turns out he was he star of the show, so says his mama.